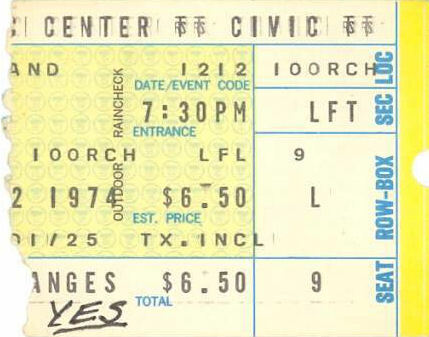 This was my first Yes concert, I went with my buddy Steve who was sick with a cold. His mother did not want him to go, but he had to go! We both had wanted and waited to see Yes for years. We were 16, had wheels to get there and we went. We got in the civic center early and went down to the stage. There was a white curtain so you could not see what the stage looked like. Steve and I heard someone noodling around on a keyboard so we stuck our heads up close to the stage and looked thru the side of the curtain. There was Patrick Moraz playing. He saw us and waved to us. That was pretty nice of him and cool. The show was fantastic! The sound was great and the stage lighting and scenery was wild. 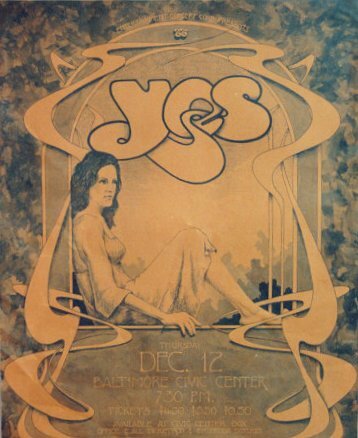 I loved it and have been hooked on Yes live since that time. Hearing GOD and Ritual were real highlights. I have seen Yes 35 times or so since then and traveled to other states, but that first show was magical. It was all Steve and I could talk about in 11th grade English the next day. To this day Steve and I are friends and while we both live in diferent states, we always get to a Yesshow when they come around.